If you’re an angler, then you would probably regard a house in Brackwansha in north Mayo as heaven on earth. 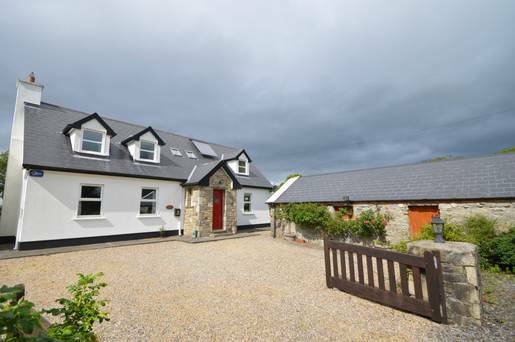 This is where Bumble Cottage, on the market with an asking price of €230,000, reduced from €250,000, sits, slap in the middle of Ireland’s finest fishing country. June has had plenty of opportunity to use the bumble fly – she bought the cottage as a holiday home for herself and her family in 2006, and has long run an import and distribution business for high-end angling gear with – until she sold it last year – a retail outlet based in Foxford. To the east of the property is the mighty River Moy, which is one of the richest salmon rivers in the country, known for famous fishing spots such as Ridge Pool and the Cathedral Beat along its route to the sea at Ballina. To the west is Lough Conn, famed for its brown trout, along with its sister lake Lough Cullin to the south. It is a five minute walk to Lough Conn, says, June, who is a former British Open long distance canoe champion, and loves nothing better than to take her canoe out on the lake to fish. She originally paid €275,000 for Bumble Cottage – it was built in 2005 – and in the time since has upgraded it with insulation and solar panels to bring the BER up to C1, surprisingly snug for a new build of the period. The property is built in the traditional dormer style and is deceptively roomy inside. There is a tiled hallway, a living/dining room with an open fire, and double doors leading into a sunroom that gives magnificent views to the Nephin range and Lough Conn. French doors lead from the sunroom out to the rear garden and a patio area, angled for maximum sunshine. On summer evenings it must be a perfect spot for contemplating the day’s catch. The kitchen/dining room has country-style built-in units, an electric hob and oven, and is plumbed for a washing machine and dishwasher. There is also a bathroom with bath on this level. The first floor comprises three bedrooms. The master is a good-sized double-aspect space with a shower en suite. There is a further dual aspect double bedroom, and a single bedroom as well as a family bathroom with shower over the bath. The grounds run to 0.7 acres, and are planted with mature trees and shrubs. June added a boat house to store her 19 foot fishing boat and all her canoeing and angling tackle. It makes a useful garage or storage space, and has a roller door, is fully wired and extends to 44sqm on the ground floor, with an upper storey offering an additional 21.7sqm of storage. The original single-storey stone shed to the side of the main house was also restored, re-roofed and wired for electricity. It would make a fine home office for any purchaser wishing to work from home – there is broadband – or, subject to planning permission, could be converted for use as a granny flat or extra accommodation. June estimates that in total she invested €100,000 in upgrades and restoration. Now she is downsizing, so her Mayo retreat is on the market. Ballina is 10 minutes’ drive away, with local institution Heffernan’s Fine Foods for the weekly shop, and Belleek Castle or the Ice House for more serious fare. Knock airport is 38km away.